In the early 1940s he attended the Northampton School of Art, before joining the RAF where he served as navigator during the War. Then in 1946 he enrolled at Goldsmiths College in London. He graduated four years later with a National Diploma in Design. Irvin would later return to Goldsmiths in 1962 where he taught Art for over twenty years. Throughout the 1950s Irvin began to develop his unique style of literal meaning through his painting. In his early career he battled with the two alternatives of abstraction and figuration. It was not until the mid-1950s when Irvin finally moved away from relying on figures and social realism in his work and embraced an approach closer to metaphor and the abstract. Irvin’s reputation began to swell in the art world as his paintings grew in merit, maturity of style, and value. He was invited to display his work at more and more exhibitions in both Britain and abroad. A new freedom to experiment also found its way into over his work as he ‘played’ with canvas size, colour, structure, shape, and composition. He began his screenprinting career in 1980. The collaborative approach of screenprinting, although a new and very different outlet from painting, still allowed Irvin to display many of his characteristic traits as an artist. He would quickly affirm his reputation as one of Britain’s foremost printmakers. 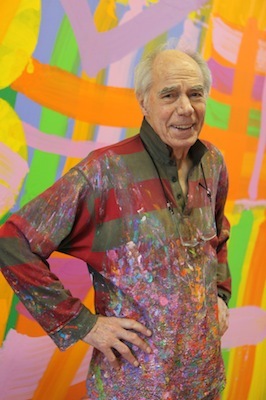 Albert Irvin - born 21 August 1922 - celebrated his 90th birthday in 2012. 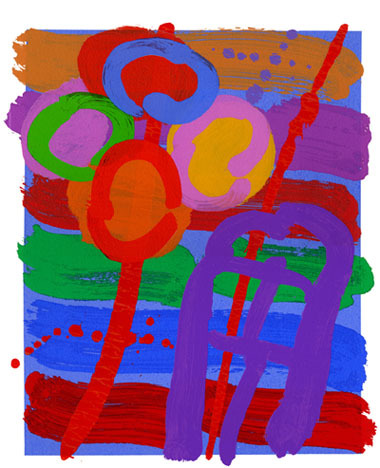 He is still very much active both as a painter and screenprinter. To mark his long and influential career as an artist, tutor and inspiration to his many admirers, look out for a range of events, exhibitions and new work taking place or on show around the world.